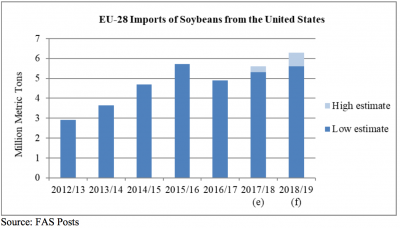 Business news articles continue to highlight how Chinese soybean tariffs are impacting the international sale and purchase of soybeans. Today’s update looks briefly at a few of these recent news items. Last week, Reuters writers Josephine Mason, Hallie Gu, and Karl Plume reported that, “The executive from one of China’s biggest soybean crushers sat on a panel at a Kansas City agricultural exports conference, listening to an expert beside him explain why China would remain dependent on U.S. soybeans to feed its massive hog herds. “When his turn to speak came, Mu Yan Kui told the international audience of soy traders that everything they just heard was wrong. Then Mu ticked off a six-part strategy to slash Chinese consumption and tap alternate supplies with little financial pain. The comments echo a growing confidence within China’s soybean industry and government that the world’s largest pork-producing nation can wean itself off U.S. soy exports – a prospect that would decimate U.S. farmers, upend a 36-year-old trading relationship worth $12.7 billion last year, and radically remap global trade flows. “At the Kansas City conference, held by the U.S. Soybean Export Council, Mu highlighted reduced soymeal rations as part of a broader strategy, including seeking alternative protein sources such as rapeseed or cotton seed; tapping surplus soybean stocks, including a government reserve, and domestically grown soybeans; and continuing to boost soybean imports from Brazil and Argentina,” the Reuters article said. The article added, “USDA spokesman Tim Murtaugh downplayed the threat of China displacing U.S. soybean supplies. The Trump administration, he said, is analyzing import demand and ultimately aims to win back access to the China market under better terms. ‘It’s not surprising that China would float this idea, given the trade dispute,’ he said. 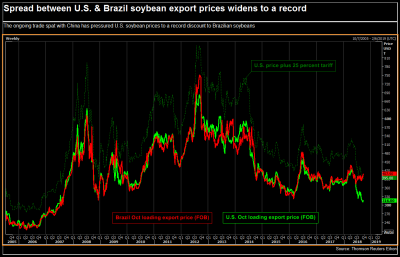 “Even with the additional 25-percent tariff, U.S. beans are still cheaper than Brazilian offerings, and the spread between the two producers for October widened to a record this week,” the Reuters article said. Spread between U.S. & Brazil soybean export prices widens to a record. “For bold Chinese buyers of soybeans, bargain U.S. prices trump trade war,” by Hallie Gu and Josephine Mason (September 21, 2018). And Bloomberg writer Isis Almeida reported last week that, “President Donald Trump’s trade war with China is turning the global soybean market into a merry-go-round. 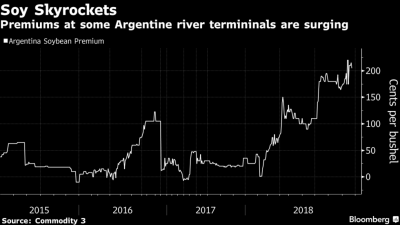 With Brazilian exports drying up at this time of the year, traders are having to get creative to supply the world’s largest buyer. 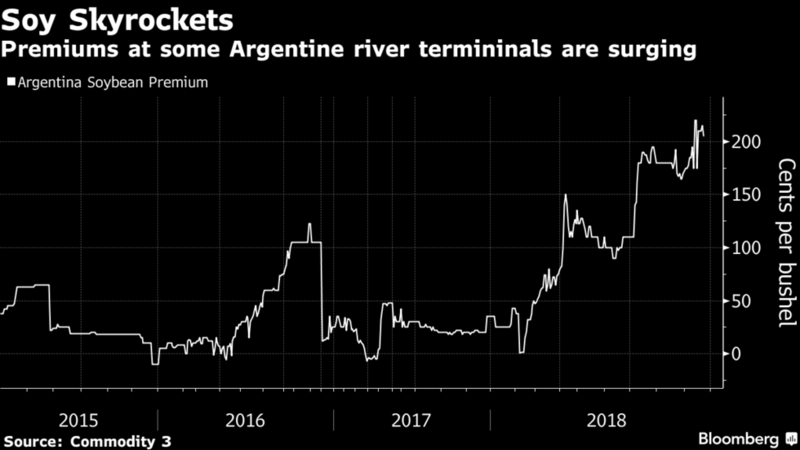 One strategy is to bring U.S. soy to Argentina and ship the South American nation’s output to China, thereby avoiding the Asian country’s 25 percent tariff on American product. “Trump Trade War Is Dividing Farming World as China Demand Shifts,” by Shruti Singh and Tatiana Freitas. Bloomberg News (September 21, 2018). EU-28: Oilseeds and Products Update. 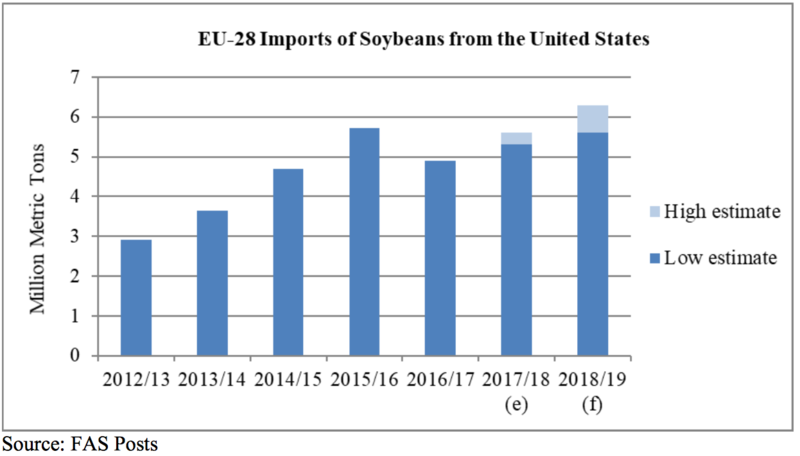 USDA- Foreign Agricultural Service (September 12, 2018). The Trump administration is set to announce a policy change allowing year-round sales of gasoline with more ethanol, a move that could bolster Midwest Republicans in tough election contests and appease corn farmers battered by agricultural tariffs, according to people briefed on the plan. Meanwhile, recent news regarding a potential truce in the ongoing trade dispute with China is not positive. Wall Street Journal writer Lingling Wei reported Saturday that, “China scotched trade talks with the U.S. that were planned for the coming days, according to people briefed on the matter, further dimming prospects for resolving a trade battle between the world’s two largest economies.